Through a grant from the Robert Martin Ayers Sciences Fund, the AAVSO is performing an all-sky photometric survey. This survey is conducted in eight filters: Johnson B and V, plus Sloan u', g′, r′, i′, z_s and Z. It is valid from about 7th magnitude to about 17th magnitude. Precise, reliable standardized photometry in this magnitude range is in high demand, both from our observers and from the professional community. Such a catalog will allow many research programs to quickly establish transformation between systems and efficiently achieve conversion of photometry to more fundamental physical properties. It will bridge the gap between Tycho2 and SDSS, plus cover the entire sky at the same depth as UCAC. The survey will take approximately one more year to complete. Data release 1 of APASS occurred on 2010 September 10, and contained photometry for approximately four million stars distributed among several hundred discrete fields between -10.15 < Dec < +87.35. There have been 9 additional data releases in the intervening years, with the latest, Data Release 10, occurring on November 16, 2018. We expect the next data release in early 2019 covering the ~100 additional north/south nights acquired through the end of 2016. The catalog now contains photometry for 128 million objects in about 99% of the sky. About 510,000 images have been taken so far! 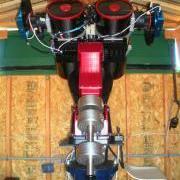 APASS is a public service to the astronomical community, and was funded through generous contributions from the Robert Martin Ayers Sciences Fund, the National Science Foundation (NSF AST 1412587) and the AAVSO endowment. APASS would not have been possible without substantial support from many vendors, including ASA, Software Bisque, DC3 Dreams, Diffraction Ltd., Apogee, Astrodon, and others. The dozens of volunteers were equally essential! If you use APASS for your research, please consider supporting the AAVSO with your membership or a contribution. You should also acknowledge APASS with the following credit line: "This research was made possible through the use of the AAVSO Photometric All-Sky Survey (APASS), funded by the Robert Martin Ayers Sciences Fund and NSF AST-1412587." Johnson B and V were chosen to extend the Tycho calibration to fainter magnitudes and to match the many archival published datasets. These passbands can be easily used to create sequences for any VSX / GCVS star. 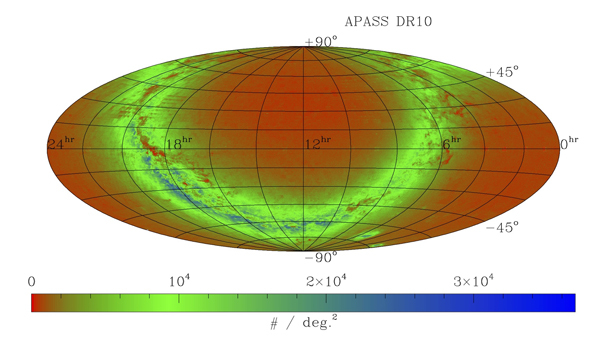 Sloan passbands provide a direct link to the SDSS, SkyMapper, PanSTARRs etc. surveys, and provide a homogeneous catalog of brighter stars. The Johnson B and V magnitudes are on the Vega system; the Sloan u',g',r',i',z_s and Z magnitudes are on the AB system. Astro Systeme Austria (ASA) has given us a substantial discount on four of their N8 20cm astrographs. Software Bisque has loaned us a Paramount ME for the duration of the survey. Twin astrographs are placed on single Paramounts and take simultaneous images of the same field, but in different filters. 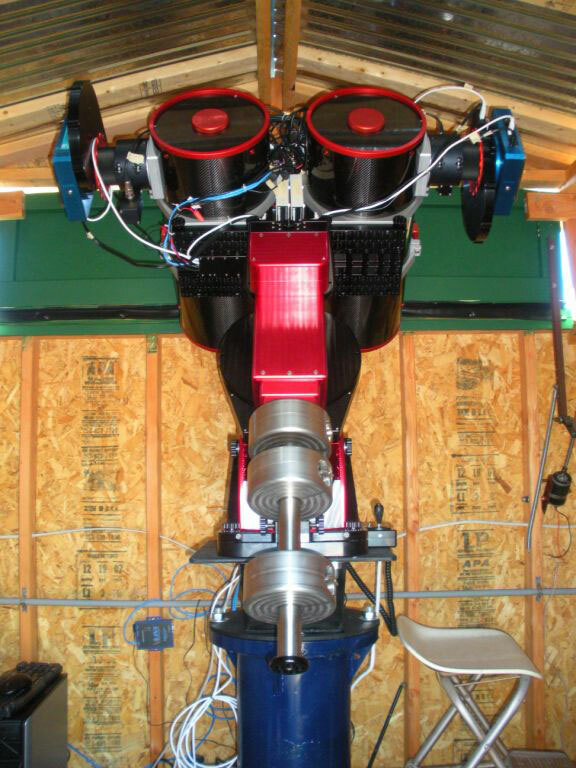 We use Apogee U16m 4kx4k CCD cameras, plus their 7-position filter wheels, for those astrographs. MaximDL from Diffraction Limited controls the cameras; ACP and ACP Scheduler from DC3 Dreams, Inc. provides the observatory control and queue scheduling. The system was initially sited in the north at Dark Ridge Observatory (DRO) near Weed, NM, (Tom Smith) and recently moved to Mayhill, NM (Bill Stein). The southern system is sited at CTIO, originally in the PROMPT6 clamshell (Dan Reichart) and more recently in the MEarth rolloff (Jonathan Irwin). Dirk Terrell (SwRI) is helping with the necessary computers and software for the telescopes; Doug Welch (McMaster) is helping on the scheduling, data processing and analysis; Stephen Levine (Lowell) is involved in the astrometric processing; Brian Kloppenborg is performing the star matching, and Ulisse Munari (Asiago) is performing much of the external comparison with existing photometry. We have dozens of volunteers, from the contributed efforts of the software/hardware vendors, to deep-sky imaging experts and quality assurance monitors. This is a major project, with 8 million stellar detections per night and terabytes of images every year. All of the data and images will be made available to the general public, and the photometric catalog will be made available as portions of the sky are completed. System characteristics are given in the table below. DR10 is a major release, where star finding has been done with Sextractor, astrometry.net has been used to recover more nights, and a new star matching algorithm has been used to better merge individual measures. DR10 is not perfect. We only have sufficient staff resources to keep up with the observing and are only minimally processing the results until the image acquisition phase is completed. The image quality is high; we know which are the good and which are the poor nights. We will reprocess all images in about a year to improve both the astrometry and the photometry, especially in crowded fields. DR10 is still missing the northern polar cap, and u'/Y measures. z_s is placed on the Sloan z' system. The photometric errors appear to be worse in DR10 than in DR9. We feel this may be due to the automated transformation method; the mean values appear to be ok. Or, it may be a bug in our calculation. We'll investigate this in the next release. The northern system had problems with the “blue” camera during the period covered by DR8. This means that the blue magnitudes (B,g’) have significantly larger error for a few monthsthan in previous releases. That error appears to be random, and so will average out with multiple visits. The red magnitudes (V,r’,i’) are fine. We are in the process of re-visiting the northern fields with a refurbished blue camera, and will replace the DR8 blue photometry when the new observations are made. We changed the B filter early in the survey. The original Astrodon B has a red leak, which causes red stars to appear brighter at B than is real. We will go back through the photometry on a later release and correct the B magnitudes of red stars using an analytical approximation to the extra flux, and also give those early measurements lower weight in the final catalog. In the meantime, inspect g,r,i for any red star, and if B doesn't make sense based on the Sloan measures, then avoid it. This only occurs for stars with (B-Ic) > 3.5. The bandpass for the two B filters is essentially identical except for the red leak. The northern survey (+20 to +90) is worse than the south, primarily due to the poorer weather in New Mexico over the past few years. Many nights had clear sections of a few hours, and then cirrus. We will be able to utilize the clear sections in the future, but right now the cirrus sections contaminate the good photometry. There are still some gaps in coverage (1% of the sky) that should be resolved in DR11.